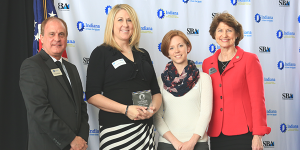 Central Indiana Small Business Development Center (CISBDC) advised two small businesses that were recently awarded the Indiana Small Business Development Center’s (ISBDC) EDGE Awards. Celebrating economic development and growth through entrepreneurship, EDGE Awards are given to emerging and established businesses that receive no cost counseling from the ISBDC. Learn more about Uptown Pup and Newfangled Confections, the two winners from CISBDC! Amanda Stetzel and Kathleen Schonsheck combined their entrepreneurial spirit, love of dogs, and canine expertise to create Uptown Pup: a small business dedicated to the care of dogs. With a firm belief that dogs should be treated like family members, the owners of Uptown Pup wanted to offer top-of-the-line services for man’s best friend including a dog day care, a spa using natural products, and specialized boarding options that meet each unique dog’s needs. To bring their business idea into fruition, Stetzel and Schonsheck turned to the Indy Chamber’s Entrepreneur Services division, a one-one-stop shop for entrepreneurs and small business owners. After approaching the Indy Chamber, Uptown Pup was first paired with a Business Ownership Initiative business coach. Together, they worked on a business plan and financial forecast. When identifying that the business would need over $50,000 in financing in order to be successful, Uptown Pup was directed to another member of the Entrepreneur Services team: Teresa Marti, a business advisor with Central Indiana Small Business Development Center (ISBDC). In 2011, Carrie Abbott was a small business owner who had recently founded a catering company. Carrie had come into contact with ISBDC when she reached out for assistance with her company’s business plan. With the help of ISBDC, Carrie launched her own gourmet confection business in 2012, and began selling what would become the company’s signature product: Frittle (a tasty combination of fudge and brittle). With Carrie’s candy company up and running, she continued to seek the direction of ISBDC. To schedule a one-on-one appointment with a Central ISBDC business advisor, please contact Karen Leak at kleak@cisbdc.org or 317.464.2228.